Are you a published (or soon-to-be-published) author? Are you trying to figure out how to get your book in front of readers? Have you thought about doing a Virtual Book Tour? Or maybe you heard someone talking about them, but really have no idea how one would even do such a thing? Today is a bit of a teaser. This is about the month-long masterclass, Maximize Your Virtual Book Tour, which starts February 5th, 2018. This is just one of five amazing courses being offered by OWS-U for the low price of $50. ($30, if we can get at least 20 students to sign up.) I have seen similar courses go for as high as $500. So why are we offering it for so little? Because those other classes are looking at the value they put into creating the course. Don’t get me wrong, this course is worth probably way more than $500 if you consider that the course instructor spent well over 500 hours creating the course materials themselves, never mind the five years honing and practicing, and perfecting the art of planning a virtual book tour. OWS-U is not about getting rich off of authors. It is not about profiting off of other authors dreams. It is about helping authors achieve their dreams. Providing them the tools and the knowledge to become unstoppable! We are here to foster a community of like-minded people who want to learn, want to apply what they’ve learned, and want to have success with their books. Why charge anything at all, you might wonder? Well, we do have children to feed and bills to pay, and it does take a lot of time to prepare these courses. Time we could spend writing and marketing our own books. But we want to give back to the community. So here we are. What will you get out of this course? 7 written lessons averaging about 5–10 pages each packed with useful links and instructions. 4 live-teacher instructions. You know, in case you have questions, like real schools provide! The goal is to teach you everything you need to know to create your own virtual book tour and measure the results. If you want to, you can build your tour during the course and get live feedback as you go. I want to clarify a few big points, because I am not going to just teach you what a virtual book tour is and how to do one. I am also going to teach you who should be doing book tours, why you should be doing book tours, when you should be doing book tours, and where you should be doing these tours (IE: how to incorporate other online resources into your book tour so that you can maximize the exposure you are creating). Because really, that is what virtual book tours are all about: Reaching as many different audiences as possible to let them know about your book. And yet so many authors don’t do them. Who Should be doing Virtual Book Tours? Everyone who has written a book. Seriously. It doesn’t matter if you are Holly Homemaker from Timbuktu promoting your first book, or Richelle Mead, everyone who has written a book should be doing a virtual book tour to promote that book. But the people who need to do it the most are us smaller authors. Why? Well, Richelle has her own private publicist, the publisher’s publicist and marketing department, and a team planning her book tours. They focus on real-life events, radio, TV spots, and spending a lot of money on advertising. Do you have that kind of budget? I sure don’t. But you know what we do have? A pretty nice list, that I have worked hard to build up over the last several years, of sites who do not charge a dime to give you promotion. It is a grassroots marketer’s dream! And for those who have some budget, we have lists of places to advertise when you do discounts as part of your tour. Here is a great video I did with Joe from GoIndieNow where we talk about why book tours are a must. One of the number one reasons that virtual book tours fail is that authors have unrealistic expectations and are measuring the wrong metrics. I totally understand this, especially because if someone is asking me to shell out a couple of hundred dollars for marketing, I’m going to expect to get that money back, right? Yes, and no. Yes, the goal will be for you to get that money back, but no you probably won’t see it during your tour (especially your first several tours). You might not see it until several months after your tour. Before we get too deep into this, let’s take a step back to most universities Marketing 101. In Marketing 101, we learn that it takes a minimum of 7 “impressions” for the average consumer to make an impulse buy. What is an impression? It’s a person seeing your product and realizing it. Reading a blog post, seeing a book review, watching the book trailer, reading a sample, and having a friend recommend the book. These are all impressions. But when you do a book tour, the audience you are getting in front of are going to that book reviewer’s site, or Goodreads, or the Facebook takeover because they are in the mood to learn about books at that moment. They are receptive, so they won’t tune it out. That doesn’t mean they will buy right then. Some might, but most will need more introductions to you. You are reaching them at the top of the sales funnel. It takes 7 impressions to move them from Awareness to Consideration, to Preference, to Purchase. I bet that’s where you thought it ended, right? Nope, we want to keep moving them through your sales funnel to Loyalty and hopefully Advocacy. That way when you launch your next book, you will see sales during the tour, because your loyal followers will buy it. And many of them will happily share your announcements and encourage their friends to buy it. 1. It helps with SEO (Search Engine Optimization) When we plan this right, not only will there be tons of information when someone searches your name or the title of your book, you will even come up under your genre. We’ll talk more about this later when we go into the media kit. 2. It creates evergreen content that you can continue to share on social media and can add to your website as social proof. 4. It helps you network with people in the industry. Many book reviewers are also authors. I am. I would say that at least ¼ of my book reviewers and bloggers list are as well. Networking with other authors in your genre is huge. Trust me, start networking immediately. Authors help each other out all the time. We invite each other to events, special promo opportunities, and share our audiences with each other. 5. If you plan it right, it helps you build your platform. What is your platform? It is your sphere of influence which takes into account everything from your social media followers to your email list, to real life contacts that you can utilize to spread your message. Platform is the reason that celebrities have no problem getting books published. We will discuss ways to use your tour to build your platform in the pre-planning phase. Lots of reasons why you should be doing virtual book tours, right? So, now that we know the why of doing a Virtual Book Tour, let’s move to the when. When Should You Do a Virtual Book Tour? The most common tours you will see are book launch tours. These are typically huge pushes to get the word out there, and build momentum for a new book. I have been surprised to see more and more short hard-pressed book launch tours, such as 10 posts done over the course of a week or authors sending out mass emails with their media kit and asking for bloggers to just post between these dates. Although there is something to be said for having multiple blogs post in a day to boost your SEO, in my experience (both as a blogger being a part of such tours, and as an author who has had bloggers that post multiple times in a day, leaving me feeling neglected). The behavior might be good for SEO; but it is poor etiquette, it doesn’t establish good relationships, and because of the lack of organization it is hard to track, thereby making it hard for you to engage with these bloggers’ fan base and convert them to your own fan base. If SEO is your goal, then rock that quick and dirty. But in my humble opinion, I would save such techniques for when you are announcing a free day or promoting a special discount. These are less about relationship building and more about boosting sales..
For my book launches, I aim for a 6 week tour. Three weeks before the book launches, and three weeks after, to keep the momentum building. I aim for a stop a day. Not a whole lot of pressure, right? Most authors quit there, but I think that’s foolish. I love doing mini book tours throughout the life of the book to keep the SEO in good standing, to keep reaching new audiences, and to keep building evergreen content until the next book launch in the series. The reason that I only do mini tours after the first big push is that once your book has been out, it gets harder to get book reviewers. Why? Because book reviewers are more interested in what is hottest or what is newest. Newest is easy to control, hottest? Not quite. Still, there are ways to keep it fresh and alive. One way is to do a Holiday blog hop and team up with a couple of authors in your genre (even better if you can do it around a holiday that is relevant, or find a clever way to re-appropriate a holiday like horror author A.F. Stewart does with her Bloody Valentine’s hops) Have the authors each gather five stops on the hop over the course of five days. (So if there are three authors, then that’s a total of 15 stops.) Create a bundle that participants can enter for if they attend all stops in the tour, and then also have a personal giveaway for your stops (not the same thing as what is going into the bundle) and use the hop to build up your email lists. Do an anniversary tour- a short tour to celebrate the anniversary by giving away a signed copy of the book. Do a promo tour, this is where your discount sites list will come in handy. Offer book reviewers and their audience the opportunity to get the book at a discount. Do a little bit of brainstorming. I bet you can come up with some other clever ideas of when you can do a virtual book tour. Now, let’s talk about where. Where do You do a Virtual Book Tour? As we mentioned at the beginning, these are online events, but to really maximize your event, don’t just stick to blogs. There are tons of sites where you can get your tour out there and build buzz. I also create a Goodreads event and invite all of my friends. I have worked hard to cultivate that list and they are all readers and authors. I post the tour announcement about a week before, when I have already established all the stops on the tour. As part of the announcement, I let everyone know about the special promotions or giveaways that are happening during the tour. Another great idea is to release sample chapters on Wattpad or Figment. Pull those fans into the tour. Do a Facebook Takeover during your tour. Pull in those authors’ fans as well and make sure that you let them know about the tour. Do a themed chat on Twitter with planned hashtags and promote that at the beginning of the tour. Do a Youtube panel with other authors in your genre. Run an Instagram contest. Give them the hashtags to use to help you trend. All of these are virtual tools that can be used on their own, but when you combine them with a virtual book tour where you are going from book blog to book blog, you take what was the equivalent of a reading at a bookstore, and turning into a book party. Oh, and you can have a real life book party and invite the internet to join through Youtube live. Seriously, you can make your virtual book tour as big and amazing as you want. After reading all of that, you are either super excited and your mind is reeling with the possibilities, or you are absolutely overwhelmed and scared out of your gourd. Don’t worry. I am here for you. What do you do next? 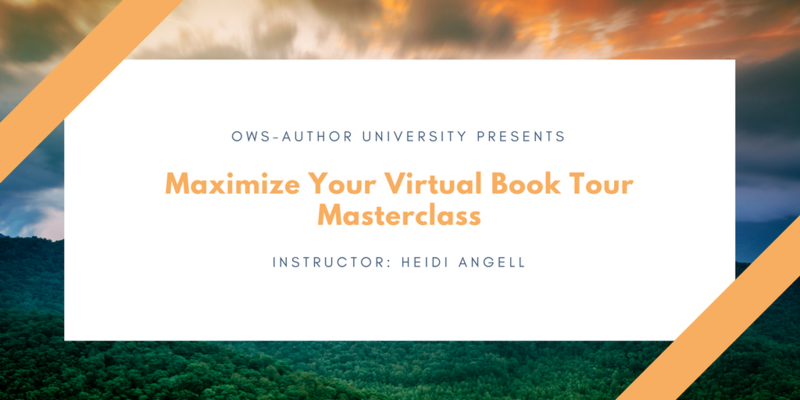 Sign up for Maximize Your Virtual Book tour Masterclass today. Share this with your author friends and get them to sign up as well. Check out the other awesome courses being offered by OWS-U. Have any questions about the class? Let me know in the comments below! If not, I look forward to seeing you in the class February 5th!